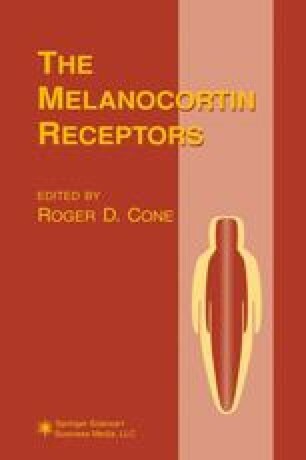 The melanocyte stimulating hormone receptor (MSH-R); melanocortin 1 receptor (MC1-R) and the adrenocorticotropin hormone (ACTH) receptor (MC2-R) were the first melanocortin receptors cloned and characterized (1,2). Subsequently, three other melanocortin receptor subtypes have been cloned and designated the MC3-R, MC4-R, and MC5-R. The MC1-R has been clearly demonstrated to be involved in pigmentation and animal coat coloration (3,4). The efficacy of melanocortin peptides at the MC1-R can be summarized as 4-norleucine, 7-d-phenylalanine (NDP-MSH) > α-MSH > ACTH >γ-MSH. With the availability of the cloned melanocortin receptors, several questions can now be studied. In vitro investigations using these cloned receptors may include identifying critical ligand features resulting in receptor selectivity, ligand residues responsible for differing efficacies, and how these ligand residues interact with the receptor for recognition and activation. In lieu of X-ray crystal structures, three-dimensional (3D) homology receptor modeling has become a tool to attempt to identify noteworthy ligand and receptor features. Furthermore, knowledge of the molecular mechanism responsible for the initial intracellular signal transduction cascade would be potentially important for the design of antagonists. This chapter is designed to attempt to address these issues from the available literature.